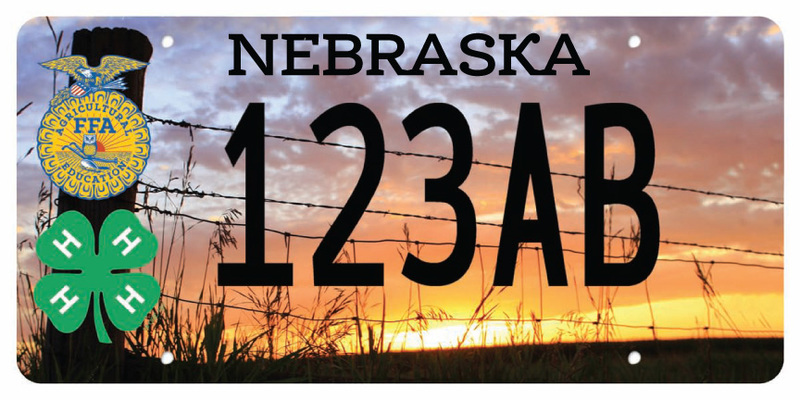 Take your support of “Making the Best Better” and “Learning to Do” wherever you go with the new license plates showcasing Nebraska 4-H and Nebraska FFA! The Nebraska 4-H Foundation and Nebraska FFA Association in cooperation with the Nebraska FFA Alumni, have teamed up to create the first ever license plate supporting the two largest youth organizations in Nebraska. Similar to other organizational specialty license plates, there must be 250 applications received before the Nebraska Department of Motor Vehicles will begin issuing this organizational plate. Order yours today by filling out the application form and mailing it along with the $70 fee to the Nebraska 4-H Foundation. Be one of the first 4-H and FFA license plate owners and show the world you are an advocate of these outstanding youth organizations. Show your support of using your “Head, Heart, Hands and Health” to promote “Premier Leadership, Personal Growth and Career Success”. No Comments to "Nebraska 4-H/Nebraska FFA License Plate"